Hello and Welcome to Part 2 of my WISYA fan meet story. If you haven't caught the first part, you can read Part 1 here. Otherwise, I left off at the photo-taking session...This is the post where I'll be writing about my experiences meeting Jasper Liu and Jet Chao, so if you're interested in what they're like in real life, please do read on! After the photo session, Jian-An said that the WISYA crew would be taking a break and they would introduce some special guests from the next drama replacing When I See You Again. The guests turned out to be the leads for Bromance 愛上哥們, Megan Lai and Baron Chen. Let me tell you, I seriously didn't recognize Megan Lai until she opened her mouth. I thought she was a K-Pop boy band Taiwanese star. But she looked excellent in her androgynous clothing! Baron Chen, Hrmmm...I haven't seen anything with him in it...but it's always a bonus to see extra stars at a fan meet because maybe I'll really love their drama...One typical plot idea I've always liked is the girl-dressing-up-as-a-boy plot...so I'm actually looking forward to this drama. Anyway, Jian-An asked if they were dressed as friends or lovers (as they were both wearing similar suits) and Megan said, "Bros!" (Like in the mates or buddies context). Baron asked the audience if Megan looked handsome, and everyone in the crowd cheered "Yes!" And then Megan asked everyone if Mandy would match her and everyone yelled out "Yes!" To which Jasper started mock coughing in offence and Megan started shrugging a "It's not my fault, I'm a hot guy" kind of shrug, much to everyone's laughter. Haha, trust Jasper to get the right cues! Anyway, Mandy said exactly what we were all thinking about Megan....which was that she made for an attractive guy...and she told Megan not to give her electric looks! (Like she felt that Megan was drawing her in with her eyes). Apparently they had held hands before the show...and they did it again to show what they meant..Jasper joked that he and Baron had also held hands! Anyway, Megan didn't even let go until Jian-An was like....Er, you can let her go now! Mandy and Jasper then passed the baton and gave good luck blessings to Baron and Megan's drama by presenting them with the Onion and Rose bouquet that You Qian gave to An Xi in the drama. Jian-An told Mandy to pass it to the person who she thought was most handsome....And Jasper joked that since these were the flowers that You Qian gave An Xi, so he should have the right to know who Mandy was going to give them to...so Mandy suggested that they both present the flowers, which they did. Then the four of them lined up for photos, changing positions so that Mandy and Megan could stand together and then Jasper and Baron....haha, Jasper even put his arm around Baron. After the onion bouquet presentation, Jasper and Mandy went on to do an interview...Then they took couple pictures by the giant WISYA poster. The pictures between Mandy and Jasper were nice....Apparently they were holding hands for the pictures, though it wasn't possible for me to capture that at the angle I was sitting at. Mandy even said on her Instagram afterwards...."Why do I look like I'm enjoying this?!" A long running in-joke of this series is that everyone love doing the leaning-against-the-wall moves on others. Mandy and Jasper get asked to do it to each other all the time in their photo shoots, Jet Chao asked Jasper to do it to him, He also has a photo where he does it to Zooey and so forth. So they had Megan Lai doing that pose to Mandy who pretended to look shy. Then they had Baron do it to Jasper (although he looks like he's just flattening Jasper against a wall and smothering him!) Jasper then did the move to Baron and all the girls squealed because he honestly made that move look good with Baron....haha, perhaps a little too good. 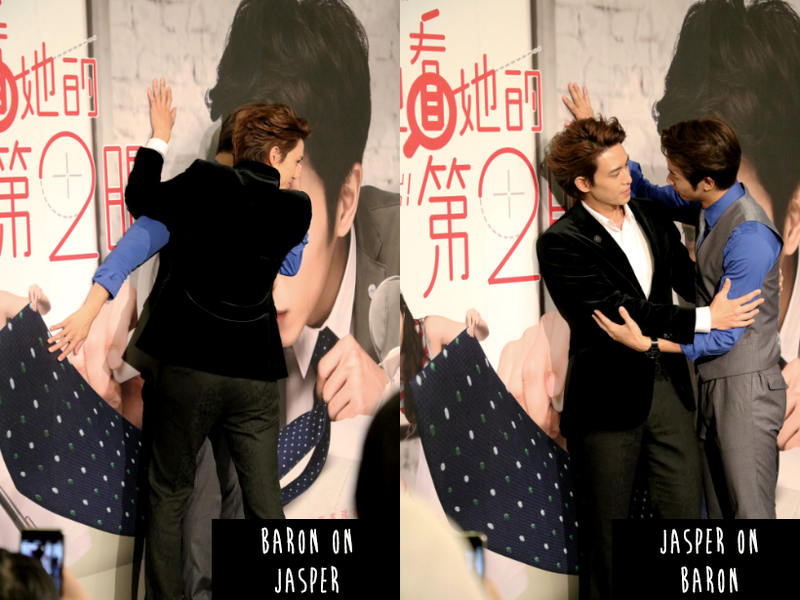 Ah, Jasper always pulling the moves with his male co-stars! Now we get to the exciting part....The actual meeting. After that sequence, they started putting tables up and Jian-An asked the 100 fans who had bought a book (and Magazine) to come up and get it signed and to meet the stars. At this point, I was so relieved that I had decided to buy the book (and that they hadn't run out of signing tickets) because it turned out those who hadn't bought the book weren't going to come up at all! On the one hand, I felt sorry for those fans for missing out...on the other hand, I wondered if it would mean more time for those who had bought a book. It turned out that was correct....this event was more fan-based...but only if you were early and willing to participate. Last time at the Pleasantly Surprised fan meet, all fans could come up and High-5 all the PS crew. But it was quick and you were pretty much up for a High-5 only (No handshakes or lingering). This time, if you'd bought the book and magazine, you could have them signed and shake hands with all the WISYA crew. So the lesson of the story? If you're at a fan meet, always investigate the goods on sale and if you hear even the slightest rumour of a signing....buy it! Also, maybe don't go away for lunch too long. I almost missed out because I was hanging at Starbucks and I was at the end of the queue for a book. I might have been the 95th person. So lucky in the end! Anyway, Jian-An explained that as they wanted to ensure everything was signed in a timely manner and 100 people was still a lot of people, only Mandy and Jasper would sign the books and magazine . Then from Jet Chao onwards, we would be able to shake hands and talk to the stars. As I was in the first couple of rows, it didn't take me long to get down to the queue...so I'd say that I was probably something like the 12th or 13th person in line. Whilst the signing was happening, Deyn came around to help and it was cute because he kept saying to Jasper (in character) "Boss, what would you like me to do?" Hahaha, still Da Yu, even when he wasn't! Deyn ended up coming to stand at the front of the queue to greet people before they came up to the table (where Mandy was to get their books signed). He started thanking everyone and shaking their hands. When it came to me, I felt nervous so I didn't think of anything to say. So I just thanked him shyly and shook his hand, which was big, warm and soft. Seriously soft. Kind of just reminds me of his overall character. Like Baymax! A little after that I came to the table where Mandy was. Mandy had asked the girl in front of me who to make the book out to (as in, who she should sign the book to), but it took her awhile to find the right characters to spell the girl's name, so when it came to me, she didn't ask. Which is fine, I didn't want to make any demands and I didn't want to have to explain which characters made up my name, because that would be possibly too confusing for me! Mandy just signed my book and my SPOP magazine and I said, "Thanks Mandy!" She smiled a friendly smile and nodded at me. Next was Jasper. I felt pretty nervous because I hadn't thought of anything to say and I thought, I'll just let this pass by. After all, I'm getting a book and magazine signed, it's not like he expecting conversation....So he was signing my book and I said "Thanks Jasper!" And at the same time Jet Chao had just been passed a microphone by Jian-An, who I heard saying in the background "Talk to your favourite stars. Stars, don't forget to shake everyone's hands! "...So, not to clog up the line, I moved closer towards Jet Chao, who extended he hand for a handshake and said "Hello, how are you?" ....Wait I'm just going to do this part in a conversation format. By the way, I said exactly what I said at the Pleasantly Surprised fan meet. Yeah. That old chestnut about coming from Australia. Trust me, I cringed when I said it. I don't mean to boast about it or sound like a crazy fan or anything, but it's just a general conversation starter in Taiwan because people can often tell that I don't have the local accent. My Chinese isn't bad by any means and I have no trouble getting around by myself, but I don't sound Taiwanese....so I usually just say it by way of explanation. Also, I think it's nice to let them know that their show reached someone very far away, who loved it enough to come and see them. Jet Chao, shaking my hand: Hello, how are you? Me: Yeah good! ...I came in from Australia to see you guys today. Jet Chao: You came in from Australia?! Jasper Liu: Are you for real? Jet Chao: Did you come in today? Like today today? Like this morning? Me: Last night, early this morning. Jasper who had just finished signing my book and magazine passed them to me. Jet Chao: And how long will you be staying in Taiwan? Jasper Liu: Here, better let me shake your hand then! Jasper took my left hand and shook it (He was signing something with his right hand). What did Jasper feel like? Haha, he had a nice firm grip and also a really smooth hand. I wish I could describe this better, but every time I do one of these, I feel faint when it comes to Jasper. I just look at his beautiful face and feel like I might just pass out. Jet Chao [in English]: Have a good trip! Jet Chao shook my hand again. He had a light, strong touch and a really charming smile. Like so very, very charming. I felt like I probably broke into a sweat from being in the presence of two amazingly good-looking and charismatic guys! So much pressure just to keep moving. Me: Thank you. I really think your character Yan Ze is cool! And that was the end of that because Jasper had finished signing the books and magazines of the girl behind me...which meant we had to keep moving down. This conversation wasn't caught on camera by the way! I checked the Sanlih video footage thinking it might have been....not because I wanted to be on TV (I feel that would have been embarrassing)....But because I wish I had some proof of speaking to Jasper and Jet Chao. It felt like a dream. I didn't have a friend to take photos of me or for me, so I thought it would have been nice if there was a recording. But unfortunately, Jian-An choose that moment to move the camera down to the end to interview Deyn and Lawrence. I'm in one tiny, tiny corner in the background before the camera moves which is how I know that happened. One embarrassing thing I did was I kept shifting my book and magazine down the table even though, only Jasper and Mandy were signing...but if Jet Chao noticed me doing that, he didn't make it awkward for me. I realised eventually when I came to shake hands with Tina and said "Oh Sorry! What am I doing?" She laughed and shook my hand nicely and I said "Thank you!" Gao Meng Jie was brief and said "Thank you" to me, as I said it to him. Sara was really smiley as she said Thank you and Zooey shook my hand shyly and thanked me. I wish I'd said something more to her...but I was in total dream-mode after the Jet-Jasper interaction I had. I got to Lawrence and he was so engrossed in his interview that Jian-An was reminding him, "Don't forget to shake hands!!!" So he shook my hand, which I don't have much memory of to be honest because I was still floating on a cloud. The rest of the time was spent watching the 90 other people interact with the stars. I really liked the interactions. It was hard to see what Mandy was doing because she was at the start of the line and was always covered by someone getting their book signed. I could see Jasper sometimes....One fan held his hand the whole time he was signing her book! But at times he was like Mandy, all covered up by fans. The one person I could see really well from my angle was Jet Chao. And he was super sweet to all the fans. One girl bought in presents for all the stars (despite Jian-An's ushering..."No presents! Please don't leave presents") and she got Jet Chao some bananas and I could hear him say, genuinely touched, "Thank you! Bananas are my favourite. How did you know? (Haha, from his Instagram posts probably!) He also shook hands, and held the hands of a fan, because she was holding his hands. Jian-An was like, "Oh my God! Are you holding his hands? But Jet Chao already has someone!" Which made him laugh as he let her go. I'm not sure if he was referring to Jet Chao having someone in his life or his character, Yan Ze, having someone (Zooey or Ya En). I should add here that as an audience member, I couldn't really see the interviews being conducted properly because of the camera people in the way, who were filming it. But since watching the video, I'll translate three mini interview sequences. So Jian-An asked Deyn to interview Lawrence, and from 1:03 on the video. Deyn says, "So we can see from the show that Ya Lu is an extremely loving brother....if my sister is sick, I might drive her to see the doctor, but I won't necessarily keep hanging by her side..." Lawrence says, "But what if it's a sister that's this cute? You have a look, a sister that is as cute as the one on the right." The camera pans to Zooey who is oblivious to the fact she's been spoken about and having a laugh with Gao Meng Jie. Deyn says, "You'll have to ask my mum or dad." They laugh and then Jian-An comes and asks Deyn, "Do you like his sister?" Deyn has a shifty look and says, "Actually, you know, Da Yu has a love-at-first-sight kind of love." Jian-An asks, "Is it in the drama?" Deyn replies by saying, "Not telling" and Jian-An says he's being bad...so he goes to interview Zooey or "Little Sister" as he calls her. Jian-An greets her by saying, "Hi, Little Sister! Is your heart feeling well?" (In reference to her character, Ya En). Zooey laughs, "It's much better!" Jian-An then tells Zooey to have a talk with the SETTV audiences and her and Lawrence wave in unison and say "Hiiii!" Then Jian-An, being the cheeky person, he is asked her, "How did it feel at that moment when you had to kiss Jet Chao?" Zooey starts laughing and says, "Let's not keep talking about this..." and falls forward. But Jian-An urges her: "Let's talk about it, please?" Then Lawrence takes the microphone and says, "Anyway, the main point is...she even secretly said to the director..." At this point, Jian-An interrupts, "To add a scene? A Kiss Scene?" Lawrence: "No, she said to the director, I don't think that kiss was deep enough. She requested that the director shoot a few more angles and scenes." Zooey is looking with mock shock. Zooey: "Who? Me?!" Lawrence: "You." Zooey takes the microphone and nods her head saying, "It was me, it was me," She jokes, patting herself. Jian-An then replies, "So it was you, you you." Zooey looks at the camera with a grin, jokingly, "It was me who said that I wanted a kiss scene." Lawrence bursts out laughing and points at her, whilst Jian-An asks, "Were you shy?" Zooey nodded a "Yes"...but when asked more about it, she smiled and was too shy to articulate, so Jian-An let her off the hook. At 1:09, Jian-An gets Tina to talk about Jet Chao. Tina says that he has a nickname which is 'Little Cutie.' To demonstrate, she passes the microphone to Sara, who says "Hey, Little Cutie" to Jet with a coy grin. She also says, "He'll call me Xiu xiu" (This is her actual nickname)...Jian-An asks, "Why do you call him Little Cutie, Xiu xiu?" Sara says, "Because we have (some sort of) secret." She laughs and then Jet starts laughing, as well as Tina. Jian-An asks, "What is this secret?! Jet Chao tell us!" (At this point, I wonder if it's a real secret, or a fake one.) Sara says, "This secret, when I think of what it is, I'll tell you." Tina says it's a "Dirty secret." After that on the video, it shows the last of the signings and handshakes....I have to say I'm glad I wasn't among the last fans...they looked like they were ushered more and had less conversation time! 'kay. I'm a tad jealous. but not wretchedly jealous. Happy for you but aw man wished I coulda went.... XD SSSSooooo appreciative of the sharing of your trip. THANK YOU!! Hi! Haha, I stumbled upon your blog (post) while looking up pics of the cast of Bromance. Btw, are you watching it? I recently started and is all caught up. I'm addicted because it's so good! Now I'm gonna look up that drama with Mandy and Jasper because Jasper is super good looking! Haha. So you actually saw these stars irl? That's so cool!!! I'm loving both Megan and Baron in Bromance, so I'm envious that you got to see them irl. Anyways, thanks for the lovely post, the pics, and taking the time to translate and share your story. Have a nice day! Haha, Hi friendly reader! I am watching Bromance and enjoy every steamy moment between Baron Chen and Megan Lai!!! I can't believe that I didn't really know them both that well last October. feels like a lifetime ago! Yep, I would suggest looking up Jaspers last two dramas, When I See You Again and Pleasantly Surprised as they're both quite good. To answer your questions, yes, I saw the stars in real life. They were there for the passing of the baton to the next show taking over in the time slot, so I was lucky that I got to catch them that day! I also saw Baron at a fan meet for a brand he sponsors called Just Gold, Just Diamond a few weeks ago. You can find the story on my Jan posts on this blog :) Thanks for taking the time to drop in and say hi!!! Lol, yes, I noticed that too! I found it funny that in this post your reaction to seeing Baron was like, "okay, cool cool" but I've been lurking around your blog (which I'm bookmarking because the massive Bromance content on your blog is a gold mine, heh) so now I see Baron's name everywhere on your site and I find it amusing that he's won you (and me) over so quickly. But yeah, glad to see both Megan and Baron (apparently he's known as River, too? No wonder I kept seeing tags of this 'River' on Megan x Baron posts and I was just like, "Who IS this River person???") being on your list of fav. actors and actresses, because they're my instant favs. now too. Okay, I will jot those Jasper dramas down and will report back to you on what I think! Thanks for the recs! Wowza, I'm totally envious of you for being able to meet these stars so often and quite frequently? Does it cost money to attend these type of events? Anyways, thank you so much for the HQ pics, bts translations/general translations, personal stories and tidbits, and basically all the time and energy that you put into this blog. I'm a fan! You'll most likely see me again in your other posts (esp. Bromance, of course), so I hope to talk to you soon and spazz more about Megan and Baron. Just read this! Haha I couldn't recognise Megan at first too when I saw her onscreen as Ya Nuo. I was like, "Is this some new actor?" Your pics are incredible as usual. I mean forreal real. I know next to nothing about Jasper and Mandy but reading this it seems they are such cuties! You're one lucky duck :D I was swooning so hard reading about your conversation with Jet Chao and Jasper. Just began Bromance today and it's crazy addictive. Megan Lai seriously emulates a guy so well! Hahaha, Thanks for reading! Aren't Jet and Jasper just the sweetest guys?! I'm surprised I actually managed to open my mouth in front of them....Ah, I'm always super grateful that I got the opportunity to see everyone at this fan meet :) Oooh, hope you're liking Bromance! I have a bunch of Behind the Scenes Translations on this blog if you're interested. Megan Lai is just the coolest heroine-turned hero. How she manages to play such a suave, hot guy (whilst being a really beautiful girl) is beyond me!